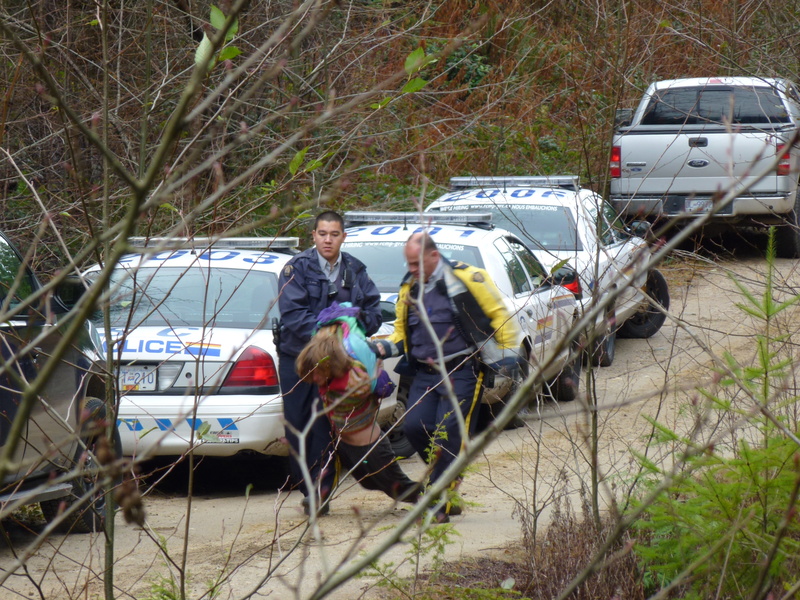 Court cases continue for 10 protesters after controversy over logging on B.C.’s Sunshine Coast escalated to an injunction and arrests on Dec. 7, 2012. 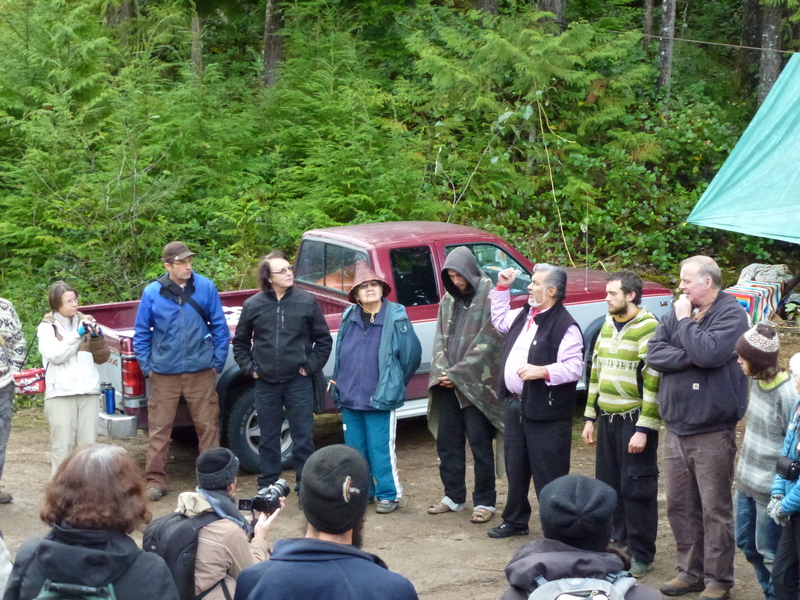 “Community Forest” calls on Police to arrest local citizens in order to log Wilson Creek Forest while 79 year old shishalh elder Xwu’p’alich (Barb Higgins) stands her ground. The protesters–including 79-year-old shÌsh·lh nation elder Xwu’p’a’lich (Barb Higgins), who was one of those arrested–argue that logging by the Sunshine Coast Community Forest (SCCF) threatens a thriving ecosystem, and they want an investigation into the SCCF’s forestry practices. 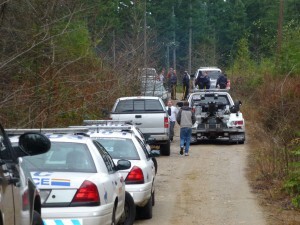 “This is the second time this coast has had such a brutal logging spree on it,” she told Raven’s Eye. “They’ve taken millions of dollars of logs out of B.C. You can’t go on doing that forever. Xwu’p’a’lich said she has found several rare medicinal plants in the area slated for logging, including ooaakslie (pronounced “oo-ack-sally”) and rattlesnake plantain, and she described the forest as thick with water-logged moss and old trees. Salmon spawning beds are also a concern to protesters. “Your feet feel like they’re walking on a big sponge,” she said. “There are probably five or six different kinds of mosses that grow there that retain the waters…. It’s like a great big reservoir. The moss and trees themselves hold that water. There are plants up there that are medicinal plants I haven’t found anywhere on Sunshine Coast. 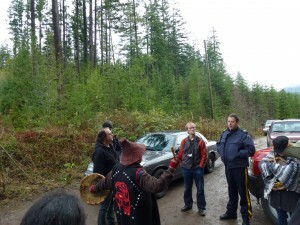 Chief Garry Feschuk said SCCF consulted Shishálh nation, whose land use plan allows logging in the areas facing protesters. “I understand where they’re coming from,” he said. “But them saying they speak for the band, I don’t know how true that is. For the chair and president of the SCCF, Glen Bonderud, the band council’s support for his operations–which are governed by a community board of directors–and environmental assessments are support enough to continue logging. 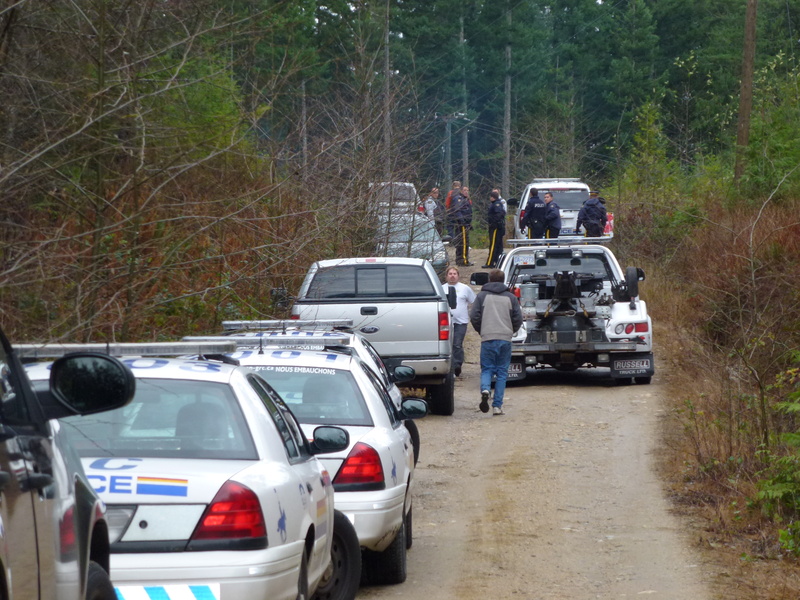 “We have a protocol signed with the Sechelt Indian Band,” he said. “They signed off on our cut; it’s not like we went against them. He said that the “peace camp” activists have not been satisfied with SCCF efforts to reduce their environmental impacts, or engage with the local community. But the issue is more complex than simply environment-versus-logging. “We’re a small operation–20,000 cubic metres a year,” he said. “That’s not a huge number. Xwu’p’a’lich decided to support the peace camp protest after a spiritual vision of her great-grandmother, who encouraged her to protect her nation’s territory–even without the band council’s support. “Some will think I’m weird, nuts, crazy–all those other adjectives,” she said, chuckling. “But the Creator said to do it, so I did it. Xwu’p’a’lich went up to the Mount Elphinstone protest camp and requested four “warriors” to place flags the four colours of the medicine wheel–red, yellow, black and white–in the directions around the mountain, she baked a salmon and held a ceremony declaring the land Sechelt territory.